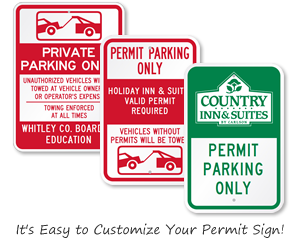 A custom parking permit sign is a huge help to your permit program. By showing your property and highlighting particular rules, you give yourself credibility. Plenty of our satisfied customers report a dramatic increase in compliance. • Our most popular messages include clear tow-away warnings. • Easily add your own text or a logo to any of the templates below. • 3M inks and films feature a 10-year warranty to guarantee quality.